Reference number for this case: Beg-Oct-54-Boves. Thank you for including this reference number in any correspondence with me regarding this case. Testimonys flow from everywhere. No more doubts about the materiality of the facts. In Boves, a suburb of Amiens, a large number of the 1.918 inhabitants saw the mysterious machines. Returning on their premises, Mrs. and Mr. Dheilly, retired postman, see an orange gleam. They warn Mr. Quin. The disc turns 4 minutes then it disappears in the shape of a crescent...". 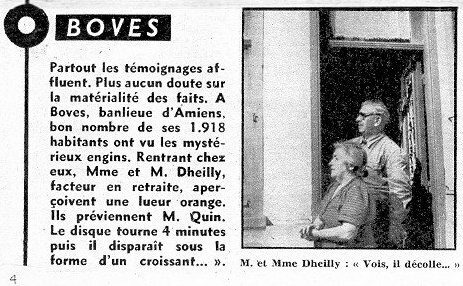 [Photo caption:] Mr and Mrs Dheilly: "There, it takes off..."
French ufologist and author Jean Sider learned in an article from the newspaper La TRibune d'Albert, of Albert, for October 9, 1954, on page 3, that at an unspecified time, several people of Boves saw flying saucers, or at least a strange gleam which moved at a slow pace. These people said that the machine seemed to fly away from the football field of Boves. The saucer was seen by Mr. and Mrs. Dhelly, Mr. and Mrs. Quin, and Mr. Roland Laporte, a tobacconist of Fouecamps. Luc Chastan indicates that in the Somme in Boves in October 1954 at an unknown hour, "In the first days of the month, five witnesses observed a strange gleam moving slowly. The object seemed to have flown away from the accesses of the soccer field." The source is noted: "Lumières dans la Nuit". The website indicates that in October 1954 in Boves, France, "Lampshade shaped disc glows, maneuvers as if about to land." And: "An unusual object was sighted, that had unconventional appearance and performance. One luminous disc was observed by several witnesses in a town for two minutes." The sources are indicated as Lumieres dans la Nuit, Lumieres dans la Nuit; Hatch, Larry, *U* computer database, Author, Redwood City, 2002. [---] Article in the regional newspaper La Tribune d'Albert, Albert, France, page 3, October 9, 1954. [ra1] Article in Radar magazine, Paris, France, page 4, October 17, 1954. [js1] "Le Dossier 1954 et l'Imposture Rationaliste", book by Jean Sider, Ramuel publisher, France, page 89, 1997. 0.1 Patrick Gross June 19, 2005 First published. 1.0 Patrick Gross March 5, 2010 Conversion from HTML to XHTML Strict. First formal version. Additions [lc1], [ud1].